Pacific Rim 2, or Uprising as the sequel to the popular film about giant monsters terrorizing what is left of the free world is due in the next five weeks. And if you’re that Kaiju (the Japanese term for giant sized monster films) fan, or even one who loves the whole fantasy genre of comic books or who was weaned on anime and manga, you’ll want to whet your appetite with this new mini-graphic novel, Bakokak, from the fertile imagination of internationally renowned comic book creator Gerry Alanguilan and Kevin Ray Valentino. 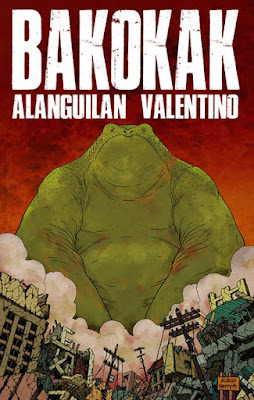 Bakokak is a 92-page black and white story about this giant frog that is horribly mutated by the meltdown of the Fukushima nuclear reactor in Japan and this kaiju arrives and threatens the Philippines. This is a fun read. I love how Gerry continues to mine his childhood days – of things that fascinated him and held his imagination. Bakokak is the latest and is an interesting left field choice after Rodski Patotski which is about a child genius. Gerry even as I knew him during our college days was a kindred spirit; an old soul who thought deep and always had a sense of humor. And looking at the cover of this giant frog looming over the homes – I had to chuckle. It was like Bakokak and the creators were having a piss at the genre; a laugh if you will. No highly intellectual stuff here, folks. Plain old comic book fun. You see even with Rodksi Patotski, Gerry hasn’t forgotten that comics or komiks in the vernacular, is escapist fare. Not everything can be highbrow and intellectual. Sometimes, it’s plain old fun. Rock and roll, you know. Bakokak can be cliché-ish – the down-on-his luck scientist, the arrogant and clueless military commander, but it is fine. It’s fun. And I love it. Valentino’s art is perfect for Gerry’s prose or storytelling. A touch of Geoff Darrow here and there. And you know what is coming – the carnage and the destruction. The spread of pages 32 and 33 is astounding. Just as Arnold Arre was perfect for Alanguilan’s Rodski Patotski, so is Valentino for Bakokak. Minimalist but no less engaging. The character of David Dalangib reminds me (whether coincidental or not, it is cool) of Jeff Goldblum’s character of David Levinson, the technical expert in the film, Independence Day. The way Dalangib deals with the threat of Bakokak is smart, novel, but also appalling. Truly, war, especially against kaijus, is hell. That giant fly robot? Man, it reminded me of Mechagodzilla in the first Godzilla film I ever saw. I am not going to delve into any pseudo-intellectual analysis because this is not what this graphic novel from Alanguilan’s Komikero Publishing is all about. It’s fun, short, and reminds you of things that we enjoyed from a much simpler time. And that is why we should be thankful to creators like Gerry and Kevin Ray. And to the medium, black and white warts and all, of comics.